Welcome to Fish Window Cleaning of Gurnee, Antioch, McHenry, Round Lake, Waukegan, Grayslake, Zion, Lindenhurst, Fox Lake, Winthrop Harbor, Lake Villa, and Ingleside, IL! We are your local window cleaning company. 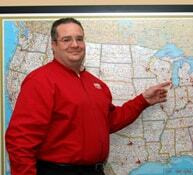 Is your home or business located in Wisconsin? 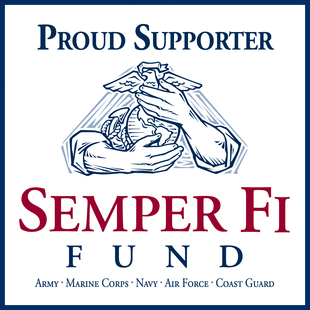 Visit our WI website. We also serve Burlington, Lake Geneva, Waterford, Elkhorn, Paddock Lake, Delavan, Twin Lakes, Salem, Trevor, Genoa City, Williams Bay, Kansasville, Wind Lake, and Fontana-on-Geneva Lake. We provide services that allow you to check multiple items off your "to-do" list. 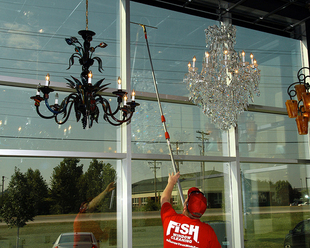 We clean screens, mirrors, skylights, chandeliers, awnings, and more! Our team is always respectful and courteous, protecting your home while giving your windows a spectacular shine. We wear fresh shoe covers and use absorbent cloth pads under each window to protect your carpet or wood floors. Our team is friendly, uniformed, as well as licensed, bonded, and insured. We are committed to your satisfaction so when you hire FISH, you have nothing to worry about! We know how important it is to give your customers an outstanding impression of your business. Clean windows make a huge difference in how your customers and potential customers view your company. We can help brighten offices, show rooms, sales floors, elevator glass, glass doors, and more! Regardless of your budget or schedule, we can tailor a program to meet your specific needs! We also provide peace of mind that licensed, bonded, and insured window cleaners will be maintaining the appearance of your business. "Fish Window Cleaning did a fantastic job and on extremely short notice. I posted the RFP on Thumbtack and was contacted immediately. They passed by while I was at work and left us a quote and were able to squeeze us in a couple days later, the job was done! They were careful and worked around our window coverings, as well as our freshly painted deck ... it's a shame that we are moving away because we'd definitely hire them again and again." We have over 125,000 satisfied commercial and residential customers nationwide. Take a look at more testimonials to see what they have to say about our services.